So that was the start of the 2015 season at Active Highs and what a busy Easter period we have had! In the last few weeks we have had families and groups taking part in white water rafting on the River Garry and as always we have had fantastic water levels and great white water rafting conditions due to the dam releases which will be on every Thursday for the rest of the season as well as some Saturdays. We also have a dam release and white water rafting available every Saturday throughout July this year! We have also been down the River Oich on both River Rafting Safari with younger families and Funyakking Trips for those looking for a bit of adventure. We have also been running some trips down the River Spean this season which have been great due to early season snow melt offering great water levels offering a variety of venues. Our funyakking trips have proved to be very popular over the last few years as a great alternative to white water rafting and the challenge of navigating the river under your own steam! We have had some great weather as well as challenging weather over the Easter break and have not yet been out canyoning due to high water and temperatures but are hoping to get out soon. 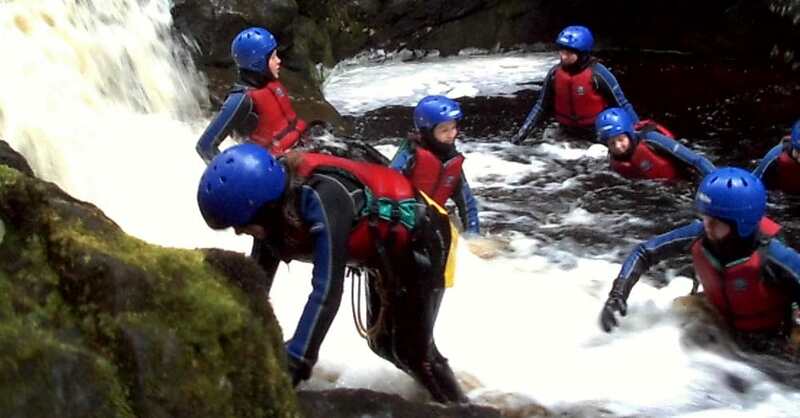 We have however managed to run 2 gorge walking trips near Fort Augustus in the Glen Doe gorge which is a great family friendly gorge walking location. Check out the picture below of the Glen Doe gorge. This year we have invested in some new sea kayaks in which we are running half day and full day sea kayaking trips on Loch Oich and Loch Ness. These new boats are great fun and are great for long trips and designed to go in straight lines over long distances. These trips allow us to see a lot more of the loch and cover great distances. We have also been running quite a few rock climbing and abseiling sessions at Aberchalder crag, a great location for anyone looking to climb outside for the first time or just have a fun introduction to abseiling. So thanks to all of you that came out to play over the past 3 weeks, it’s been a ball and look forward to seeing you again some time, remember it just gets warmer from here on in!